“Mommy, can you help me put this glove on?” Mia requests at 10 pm, on a night when she wasn’t sleepy because she had napped. 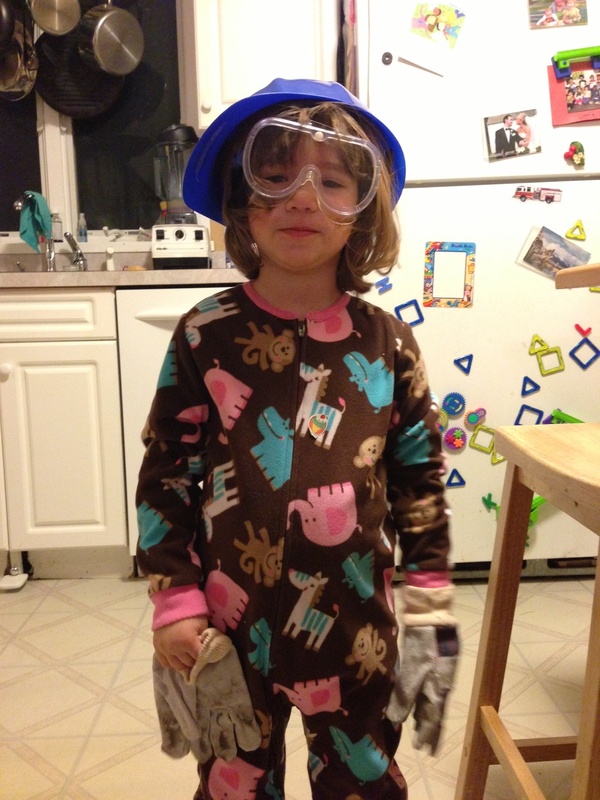 I look at my 3-year-old daughter dressed up in her big sister’s construction worker get up. She has on the hard hat, goggles, and a glove on her left hand. I smile at how much ease and grace she shows when asking for help. I grab my camera to take a picture of her before I help her. The deal is that after I’ve given them bedtime snacks, a bath, helped with PJs, and read stories, it’s time for bed and if Mia isn’t tired, she can play by herself until she’s ready to be tucked in and then she can call for me to rub her back. I squat down to help her thread her right fingers into the glove. It’s tricky for me. The glove is big. Her fingers on her right hand want to go together in pairs. She is patient as I work to find a spot for thumbkin, pointer, tall man, ring man, and pinky. She plays a few more minutes and then tells me she’s ready for bed. When both of my girls were babies, I taught them sign language so they could share their needs before they had spoken words. They both learned signs for “more,” “milk” and “eat.” Animal signs were fun too. “Help” was one of the earliest signs I taught. For me, this felt so significant. I come from a line of fiercely independent types who take great pride in doing everything for themselves. But, that’s had its costs. When people graciously offer help, I often don’t know how to receive it. As I studied the books on baby sign language, I saw the sign for “help” and knew it was one I wanted to teach. To make the American Sign Language sign for help, you make one hand into a fist and use the other hand open, palm side up to lift the fisted hand. It seemed evocative of the human connection needed to ask for and receive help. As my children learned to ask for help and I was responsive to their requests, I too learned something about asking for help more readily. I am a better mother when I get a break. It’s not essential that I pack every lunch, that I handle every bedtime. The girls have learned to welcome other caregivers into their lives so I get a bit of respite and am better able to respond to their needs when I am present with them. When Mia asks for help, it has a double meaning for me. She asks freely as I taught her before she had spoken words. She also asks freely, aware that she has a hard time putting the glove on her right hand, but at nearly four, not yet expressing much frustration about that. She just knows that if she gets stuck she can ask for help. Sometimes my help will come in the form of working together as we do to put on her glove. Other times, it may come through a question I ask or a prompt I give her to try what she is doing another way. I still value independence and perseverance, but right alongside human connection that comes from offering and receiving help. I want to model giving help as freely as my children receive it. My six-year-old Zoe is often reluctant to get dressed by herself in the morning. So, I offer her help in other ways. We make a race – Who can be last? We see who gets their socks on first, we see if both girls can work together to beat me. And, through these playful approaches, I am helping her gain independence appropriate for her age. It’s quite a journey to see those earliest seeds I planted through baby sign language taking root and blossoming into a sense of compassion in my girls. This entry was posted in Pediatric Stroke Awareness Month 2013 and tagged au pair, baby sign language, Mara, Mia, single mother, stroke, Zoe on May 22, 2013 by mara.